The classic turkey dinner is easily adapted with international ingredients and techniques. Roasted turkey, cornbread stuffing, cranberry relish, mashed potatoes and gravy ... there are few American meals more iconic than the one we prepare for Thanksgiving. Equally American, however, is the way that we embrace innovation and open ourselves to the cultures that have contributed to the fabric of our country. In that spirit, and to help you make a memorable holiday feast this year, we have asked three chefs—a Frenchman, a Spaniard and an Italian-American—to put their own twists on this most traditional of feasts. Read on for each chef's vision of a Thanksgiving menu, with wine suggestions and a recipe from each chef. 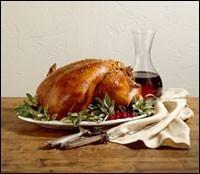 No matter what you choose to cook for Thanksgiving day, we can help you find a wine to match. While you can try our Wine Search or use our Food and Wine Matching tool, following is a list of well-rated, recently released wines from France, Italy, Spain, the United States (and other countries). All offer reasonable prices (perfect for entertaining a crowd) and youthful fruit that can handle the cacophony of flavors presented at the Thanksgiving table. On Thanksgiving day, in addition to signature dishes like homemade gnocchi with lamb Bolognese and steamed bass with shrimp polpettini, Andrew Carmellini will offer a special "Il Giorno di Graziamento" menu at his year-old restaurant A Voce. "Originally, I felt that, because we're Italian, we should be closed [on Thanksgiving Day]," explained Carmellini, "but there was some interest from customers, and I figured that a pancetta-wrapped turkey or a plate of great ravioli with white truffles shaved over the top is a fine way to celebrate." Wine Match: Joseph Phelps Le Mistral Monterey County 2004: A Syrah-based blend with Grenache, Petite Sirah and Alicante Bouschet. Restaurants: Café Atlantico, Minibar, Jaleo, Zaytinya and Oyamel; all in Washington, D.C.
Cuisines: Pan-Latin, Nuevo cocina, Spanish, Mediterranean and Mexican, respectively. Although he won't be serving a Thanksgiving meal in any of his restaurants, José Andrés has risen easily to the challenge of creating his version of the Thanksgiving feast, focused on the flavors and ingredients of his native España. "I have been doing this meal since the restaurant opened," said Chef Cyril Renaud of his Gallicized turkey and trimmings. (And for those who want an alternative to the bird, he provides a fish dish in his multi-course menu.) "It's a huge family day, but the cooking is grueling, and so is the cleanup. I want to make it so that a family can enjoy each other and not worry about doing the dishes." In addition to the chefs' suggested wines, we have listed below a number of food-friendly red, white and sparkling wines to complement a Thanksgiving feast. Gorgeous black cherry, red licorice and plum sauce flavors, with a sweet, fine-grained finish. Very pure and very long. Lovely. Drink now through 2007. 21,000 cases made. —J.M. Juicy and pure, with the vintage's textbook flavor profile of raspberry and licorice, backed by a graphite hint on the finish. Drink now through 2007. 115,000 cases made. —J.M. Plush and inviting, with cocoa and toast well integrated into the plum and dark currant fruit. Nice fleshy finish shows elegant spice and mineral hints. Syrah and Viognier. Drink now. 8,500 cases made. —J.M. Very pure and fresh, with purple and blue fruits leading the way, followed by notes of tar, violet and mineral. Open-knit, but has some grip. Delicious. Drink now. 108,300 cases made. —J.M. Alluring nose of mocha and spice, with a rich texture that carries raspberry and boysenberry fruit to a creamy finish. Drink now through 2007. 120,000 cases made. —J.M. Crisp in texture, with a light core of cherry and mineral flavors that linger gently against slightly chalky tannins. Drink now through 2009. 17,936 cases made. —H.S. Bright and juicy, offering black cherry, toast and light herb flavors. Light tannins and refreshing acidity. Nicely focused. Drink now. 15,000 cases made. —T.M. Soft and elegant, with lovely peach, pineapple and lemon flavors mingling enticingly as the finish lingers, echoing the fruit and a touch of mineral. Drink now through 2010. 10,000 cases made. —H.S. This exuberant white offers pear, grapefruit, mineral and light herb flavors. Fresh and focused. Has breadth and grip. Drink now through 2008. 16,660 cases made. —T.M. Pineapple, honey aromas follow through to a medium- to full-bodied palate, with lemon and white peaches. Fresh acidity. Drink now. 120,000 cases made. —J.S. Lots of apple and honey character. Medium- to full-bodied, with fresh acidity and a medium finish. Very lively Chardonnay. Reminds me of a Chablis. Drink now. 17,500 cases made. —J.S. Graphite and pear notes permeate this medium-bodied Champagne. It has good grip on the palate, a combination of acidity and chalky mouthfeel. Drink now. 100,000 cases made. —B.S. Earthy, somewhat tart style has a welcome generosity and sense of pear-centered richness as the finish sails on. Drink now. 50,000 cases made. —H.S.